Scientists believe that clouds and weather phenomenons are to blame for the hundreds of missing vessels and several deaths in the 500,000 km square patch known as the Bermuda Triangle. 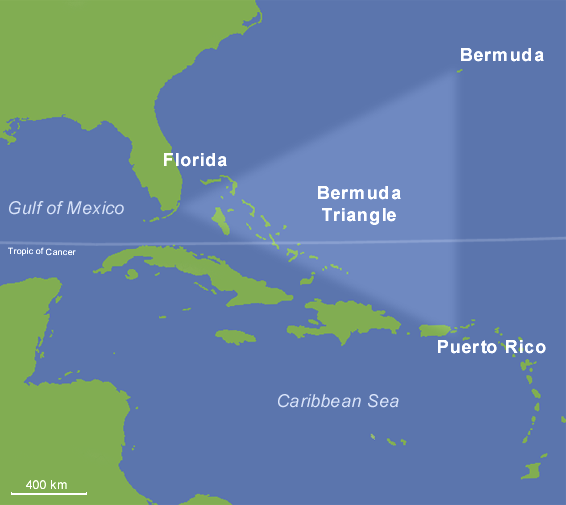 The Bermuda Triangle, also known as the Devil's Triangle, is a loosely-defined region in the western part of the North Atlantic Ocean, where a number of aircraft and ships are said to have disappeared under mysterious circumstances. However there is a new theory that hexagonal clouds are to blame. Hexagonal clouds can create "air bombs" with winds of 270 km/h and create waves of up to 14 metres. Scientists claim that this may be to blame for disappearing ships and planes.